Scuba Gift Ideas For Men - Buy A Present For Your Diver - Or Yourself! Thinking of scuba gift ideas can be hard, whether you are a diver yourself or not. You want to find a present that he will use, enjoy or just get a chuckle out of - if not all three. So whether it is for Father's Day, Christmas, a birthday, an anniversary or another occasion, I have some suggestions for you. While the following gifts are geared more toward men there are a few unisex gifts to consider too. Some of these scuba gift ideas are practical while others are more on the fun side. Whatever present you do decide on, it is sure to make him a happy diver. I also picked out several gifts that are fully customizable. You can choose whatever photo/design to put on the product for a truly one of a kind gift. He will know you were thinking of him when you give him his custom gift! The presents on this page are at all price points. There is something for every budget. Also check out the links just below for more scuba gift ideas. 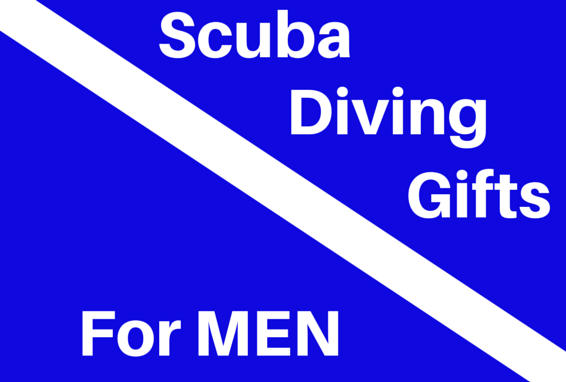 We also have scuba gifts that are appropriate for both men and women. So let's get going. Here are my top scuba gift ideas for men. Let's face it - not all dive boats and shops are created equal. Nothing could be worse than getting ready to dive and you find out something isn't working. This repair kit can come in very hand to save that very expensive dive or dive trip. 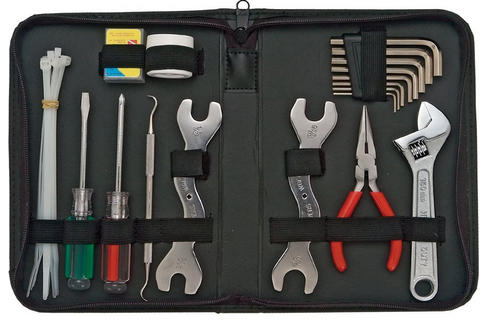 This kit comes in zippered pouch and includes 2 specially developed Scuba Wrenches (wrenches have 4 sizes which fit most regulator 1st stage hose attachments), crescent wrench, Phillips head and flat head screw drivers, 8 piece hex wrench set, needle nose pliers, o-ring tool, 8 tie wraps, 1/4 oz. 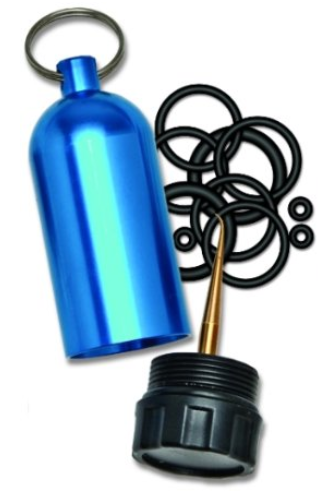 jar silicone grease and 10 piece o-ring kit. Get the details on the money clip here. 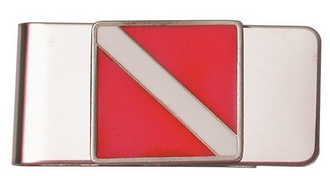 This is a nice stainless steel money clip with a pewter enameled dive flag. Perfect for holding those bills to pay for the dive and to pay for tips. LOL. Nice gift for just about any occasion for the male diver. Nice quality and practical too. This would look nice on any diver's desk - whether at home or in the office. This desk set features a pen and card holder with a clock set into the diving helmet. Also has a plaque suitable for engraving. Made of brass. Get the details on the desk set here. This is a good light as a marker light on your tank, an SMB marker, exit marker and in case the worst happens, an emergency dive light (this is NOT good for a primary dive light). 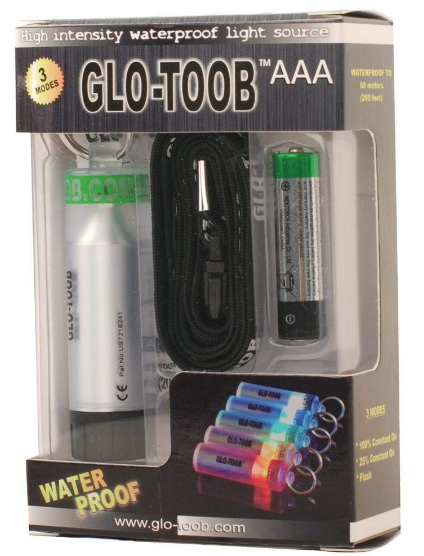 This light is waterproof to 200 feet, has 3 light modes (100%, 25%, strobe) and uses one AAA battery making it easy to replace the battery no matter where you are. Get the details on this dive light here. OK, I have recommended this gift a few times. But I think it is so unique and cool looking, not to mention practical, how could I not recommend it? It will get many comments and let everyone know what his passion is. He can use it in the car, at the office, at the gym and, of course, on the plane while traveling to his next dive destination. 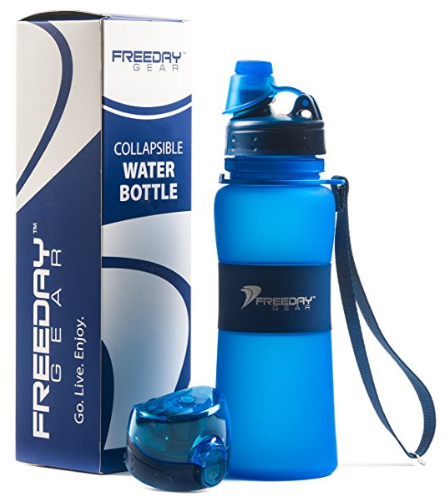 This water bottle is made of stainless steel and 100% BPA free. It is another fun yet useful gift that is sure to bring a smile to his face. A perfect way to start off that dive trip! With the way we all use our phones, tablets these days who doesn't need a way to charge on the go? Perfect for traveling to that dive site too. I have this charger and love it. I bring it on all our trips and use it all the time. It has 2 USB ports so both of you can charge your device at the same time. This would be perfect for the dive boat too. Let that battery recharge while he is diving. 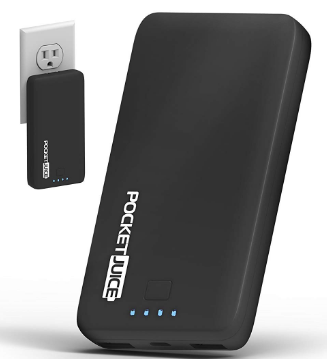 Small and compact, it charges different styles of phones. This is on of those scuba gift ideas that is fun yet practical and useful. Get the details on this charger here. Who doesn't like a scuba diving tshirt? I have yet to meet a diver that doesn't. Great for wearing around town or on that dive boat. Show everyone what your passion is. Full disclosure here - this is our dive tshirt collection. We will be adding more so come back and check for updates. I hope you enjoy them. Please let us know - we would love to hear your thoughts. Check out our Tshirt collection here. 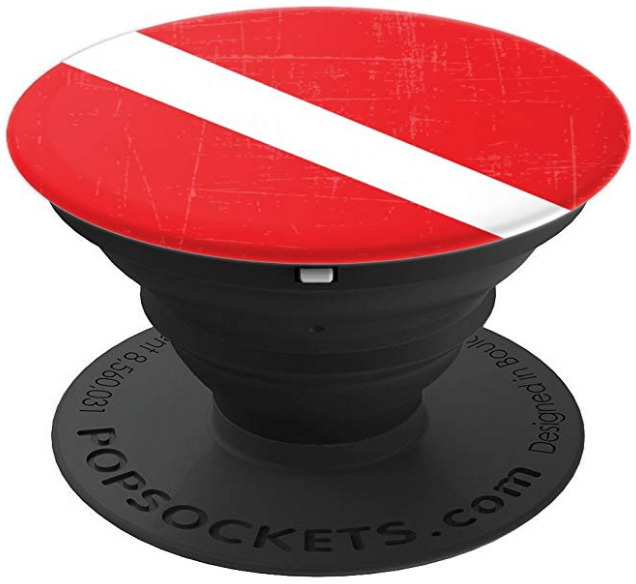 Our line of scuba diving PopSockets is here. 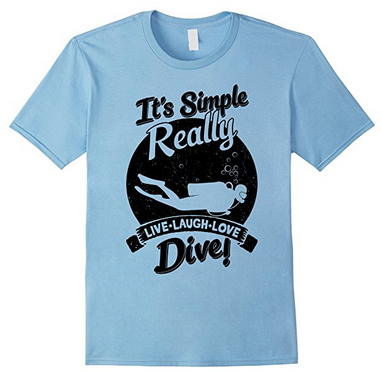 These are a fun and practical way to show your love of diving. 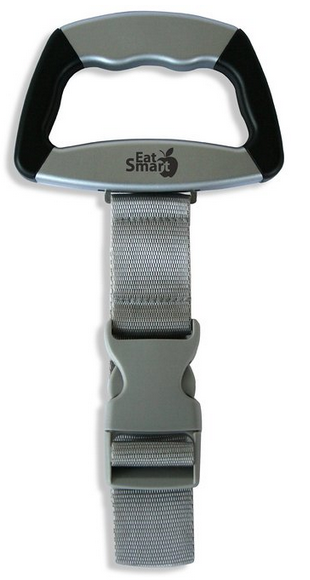 They can make so many things easier - holding phone, watching videos, hands free calling, etc. We have different versions for you to enjoy. We can also customize one if you like. Just get in touch and we would love to work with you. Think fun scuba gift ideas! Check out our PopSockets collection here. This good lucking dive flag mask bag is the perfect way to protect his mask on the way to and from the dive site. Well made it has grommets for draining, a D ring to attach to main dive big and a side pocket for mask defogger or other small items. Available in red and black. One of the practical (but nice looking) scuba gift ideas. Get the details on the mask bag here. 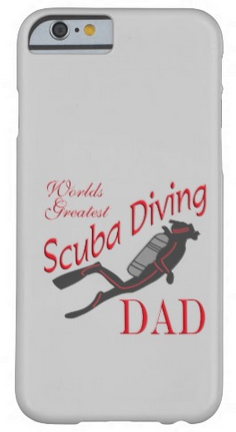 Show your Dad how much you love him and his passion for scuba with this phone case. Let the world know what he does. And best yet, this is another gift that is fully customizable. Put your own photo or saying on the case and watch him smile each time he grabs his phone. It's one of those fun yet practical scuba gift ideas. Give that special diver in your life a truly unique present. Available for iphones, Samsungs, ipods, ipads and razrs. It is also available for other products (shirts, mouse pads, mugs, etc.) so the options are pretty endless. Let your imagination run wild here! Get all the details on this phone case here. This is one of our very practical scuba gift ideas. It is perfect for the boat to keep that jacket, phone, towel, hat, wallet, etc. dry. Nothing worse than coming back on board to find a nice soaking wet towel to dry off with. I have this particular bag (in fact I have a few different brands) and it is well made. Bonus is it also comes with a waterproof phone case. Double security for that phone! Get the details on the Earth Pak here. If the diver in your life loves dive trips, he is sure to love this. A light weight yet fully functional and high quality BC. Perfect for the dive traveler, especially these days with all the luggage fees. Reading through the reviews (it is rated 4.0 out of 5.0), some divers use it as their everyday BC also. That highlights its durability. 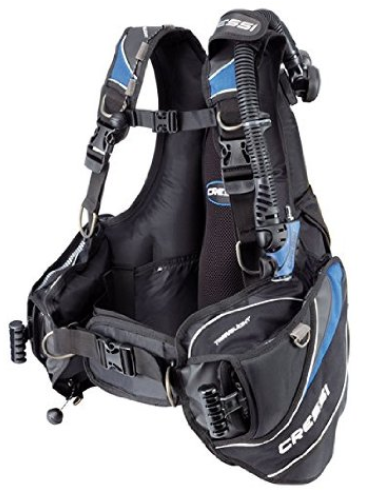 Even if he has his own BC, I think this would be a welcome addition to his dive kit. I know I would love one in mine! A very practical scuba gift ideas. Get the details on this Cressi BC here. Get the details on the water bottle here. Let him show off his passion for diving. A practical yet fun scuba gift idea. It is also fully customizable so you can upload your own image and really give him a surprise when he opens his present. Or you can pick from one of the many prints already available. These are just two of the options. One more subtle, one more assertive. 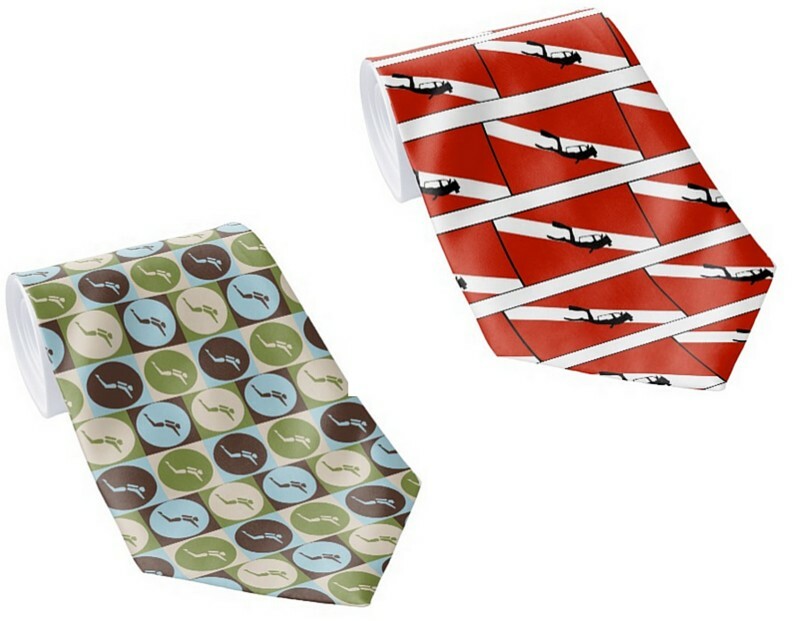 To see all the prints, just type in "scuba neck ties" in the search box (after you click on the link below) and you are sure to find one to suit his personality. This is a fun and practical gift. This design is fully customizable. 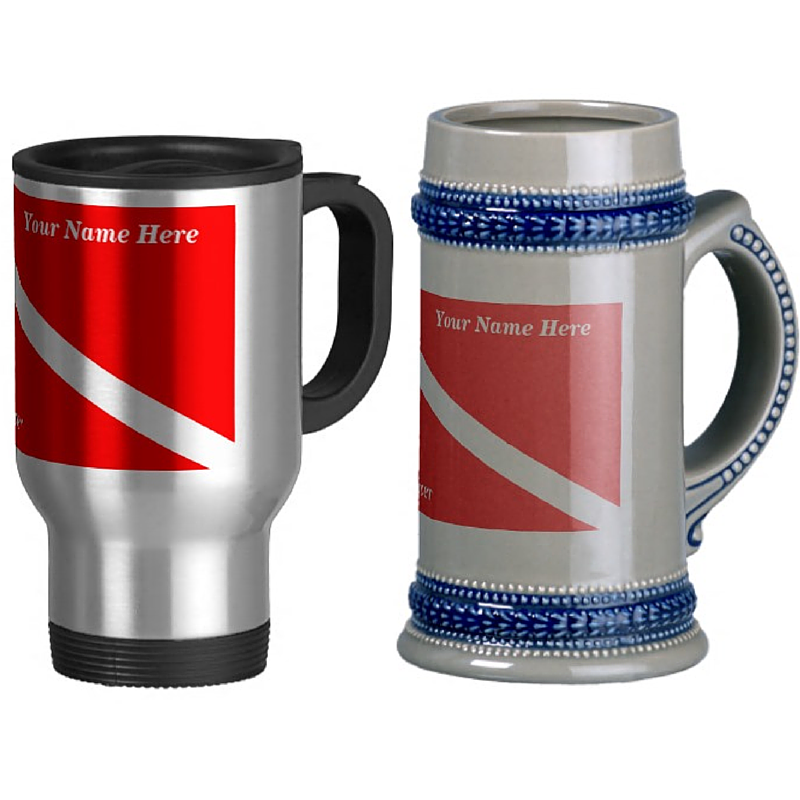 You can just add his name (and you can also replace the words "scuba diver" if you wish) to the mug or stein or you can add your own original picture to make it a truly one of a kind gift. Have a favorite picture of him diving? Just upload it and have it printed on the mug/stein so he can relive that wonderful memory with each sip. The mug is also available in white/gold if you prefer. (Note: if you upload your own picture, be sure to read the tips so you get the best quality printing on the mug/stein). One of those scuba gift ideas that will never go out of style. OK, this one looks a little weird but it is a practical scuba gift idea. Makes it nice and easy to change out of wetsuit or bathing suit without showing everything to the world. No longer will you need a friend to hold up your towel or have one fall off while you are trying to be discreet. Could be good for the dive boat too - keeping you nice and warm after those dives. It gets great reviews so why not give it a try? 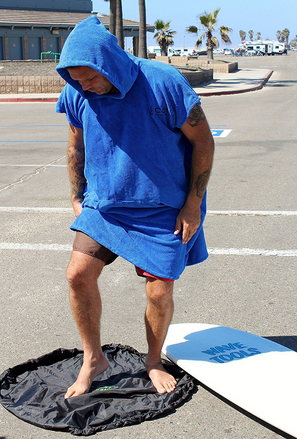 Get the details on the Changing Towel here. This will make people take notice as he sports these unique cufflinks. 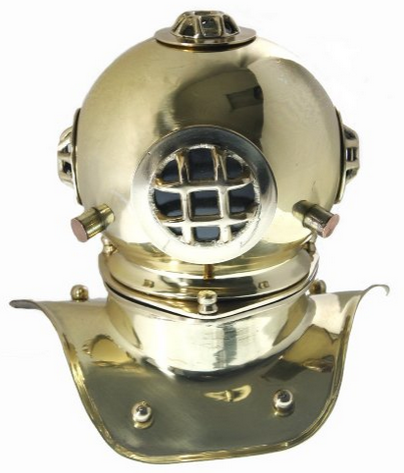 Modeled after old style diving helmets, they are sure to garner some attention. They are made of plated base metal with an antique silver finish and a bullet back closure. I think these are really neat looking and my bet is that he will too. Have some fun with these. The cuff links come in a gift box. 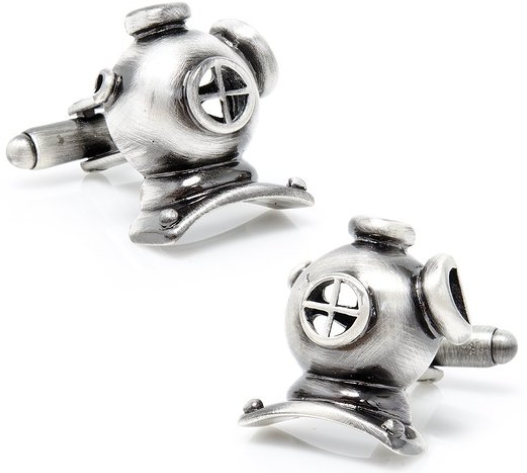 Check out these helmet cufflinks here. Now this is one of those practical and useful scuba gift ideas. He will never have to worry about getting that car seat wet after a dive again. Easier and better coverage than that old towel on the seat. This cover is made of 3mm neoprene - just like a wetsuit and will protect the car seat not just from water but also from odor, stains and wear for years to come. It slips right on the seat, doesn't slip and will contour to the shape of the seat. And better yet, it is machine washable for easy care. This is rated 5 out of 5 stars so your diver will be happy with this gift! 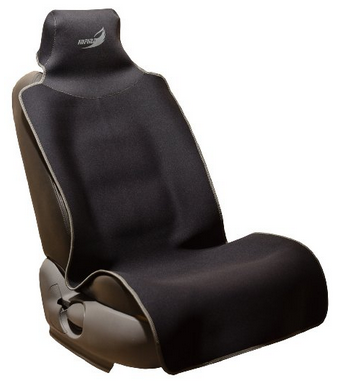 Get the details on this waterproof car seat cover here. What diver wouldn't be happy with a new dive watch? None that I ever met! It is a great gift that he can wear both in and out of the water. We looked at lots of dive watches and picked the ones that got great reviews from divers. 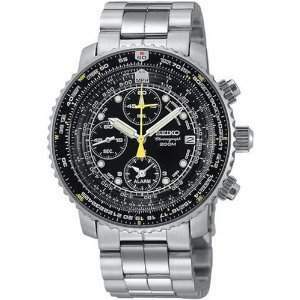 There are wonderful watches available at all price points so whatever your budget is, you are sure to find one that your diver will enjoy for countless dives. See our picks for best high end/luxury dive watches here. See our picks for best mid-range, inexpensive and budget dive watches here. 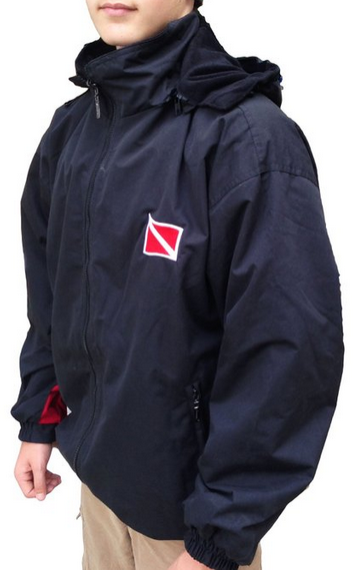 A nice looking jacket to keep him warm on the dive boat - or anytime. This jacket is reversible between water resistant and fleece so you get 2 jackets in one. The hood is detachable making it even more functional. Fully machine washable so care is easy. A nice, comfortable jacket that he will enjoy for years to come. Just what you like in a scuba gift idea. Get the details on this jacket here. Now is this a practical gift or what? LOL. His own personal - and possibly personalized - hip flask to keep him warm after those dives. I don't think he would see this one coming. So if he likes to imbibe now and then, this would be a great gift. This is also fully customizable so you can put whatever picture you like on the flask. Maybe one of him scuba diving? Everyone will know whose flask it is! One of those fun scuba gift ideas. 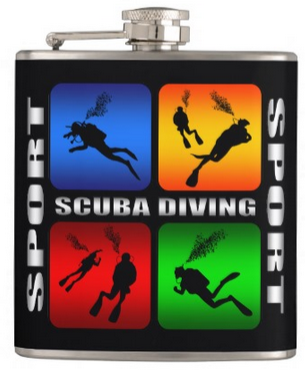 Get the details on the scuba hip flask here. This is sure to have a place of honor on his desk, table or mantel. Bring a little history of scuba diving into his life. Looking at this will bring him back underwater. Produced to look like a real antique, it is made of heavy duty polished brass and is finished to make it look a little tarnished. A unique piece and sure to be a conversation starter. Get the details on this diving helmet here. Never have to cancel a dive because of an o-ring again. This is one of those practical yet fun scuba gift ideas. This is a handy key chain, shaped like a dive tank, that contains several different popular sizes of o-rings. It also comes with a built in pick to make getting that broken o-ring out a lot easier. You always have your keys with you, so you will always have these o-rings with you. Or just attach it to your dive bag so it is always handy. Never miss out on a dive again. This present gets great reviews so rest easy. Get your dive tank keychain with o-rings here. This is the classic reference set for identification. I have had this set for years (has since been updated) and refer to it often. It is the bible among divers for identification. You can also buy each book individually if you don't want the set. This particular set is for the Caribbean, Bahamas and Florida. There are also books available for other areas of the world. If your diver doesn't have these, he is sure to love it. No more wondering "What the heck is that?" after a dive! 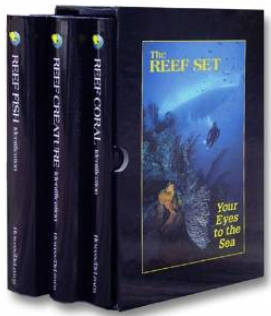 Check out this 3 volume set here. OK, this is one of those scuba gift ideas that would be great for just about anyone. It is all the rage - and understandably so. The GoPro cameras get great reviews and are able to easily capture his underwater life (plus, of course, his topside life if he wants). 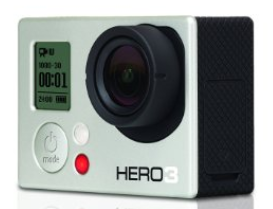 This camera is waterproof to 130 feet so it is prefect for the recreational diver. He can take photos or videos with it and it also has wifi capability to ensure it is easy to get those images off the camera and share them with you :). 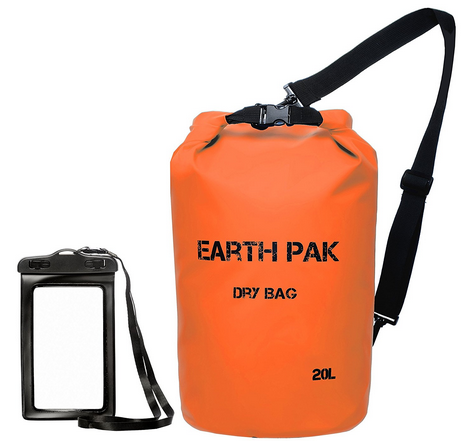 It is light and compact making it a perfect accessory to take on those diving trips. And since we spend so much on diving, having a way to relive those moments makes that dive last longer! 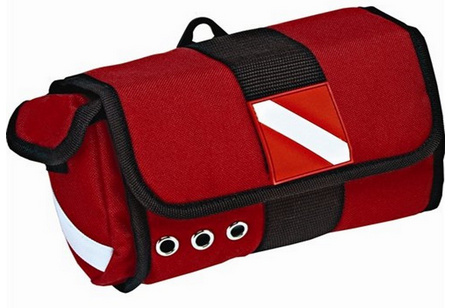 A useful and practical gift for the scuba diver - or any traveler for that matter, guy or girl. With all the restrictions and fees on luggage these days, weighing your luggage before you leave home is a must do. With all the gear divers carry, it is easy to go over the weight limit. Now he can know exactly what his luggage weighs and adjust accordingly. Saving him money and the hassle of rearranging his stuff at the airport. You know what a pain that is! This scale has a 110 lb. capacity and has an easy to read LCD backlit display. Get the details on this luggage scale here. So those are my scuba gift ideas for the male diver in your life. Hopefully you found one that will suit his needs. And of course, there are several gifts that you can customize so you can give him a truly one of a kind present. Whatever you choose, I am sure it will bring a smile to his face. Whether practical or fun, he is sure to think of you whenever he uses it. Here's wishing him many happy uses of his gift and many wonderful dives in his future! If you are considering some scuba gear, dive accessories, etc. for a gift, you might want to check out our Picks For Best Scuba Gear here.